Inauguration of the ‘Supporter Participation Satellite Project’ Launching Weathernews Micro Satellite into Space – Weathernews Inc.
Weathernews Inc. (Location: Minato-ku, Tokyo: President: Chihito Kusabiraki) has started the ‘WNI Satellite Project’ as part of its response to global warming and climate change. The WNI satellite project has been developed in conjunction with Tokyo University, Chiba University and AXELSPACE(※1) since 2005 . The planned launch of the WNI satellite in 2010 will enhance our ability to observe and “Eye-Serve(※2)” the greenhouse gases and sea ice in the Arctic Ocean. One of the innovations of the WNI satellite structure is our original Eye-Servation system that assesses the atmosphere attenuation of a laser beam between the WNI satellite and our original surface–based Eye-Servation instruments that are placed with supporters. This system is the first of its kind as it uses not only leading-edge observation technology but also depends on broad community participation. Weathernews will realize a high quality service by using the WNI satellite for the supporter, with the supporter who share similar values with the collaborative vision of this unique project. The 2008 G8 Hokkaido Toyako summit in July 2008 is an extremely important event for the Earth and inhabitants. Through the discussion about climate change and clean energy, G8 participating nations will seek the best solution to curb global warming. A strong emphasis will be given to reducing the environmental load while taking into consideration factors of both safety and economy. Weathernews is meting with this challenge by considering unlimited possibilities. Above all, Weathernews considers it fundamental that direct obeservation of global environmental change, such as global warming and climate change, is very important for all of us and that Eye-Servation will provide some new insights through our project. 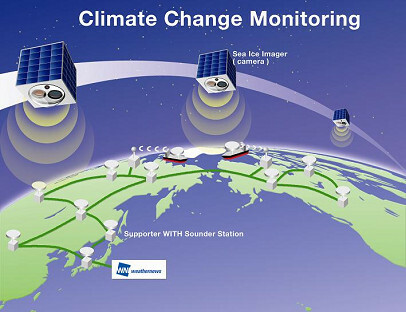 Weathernews has promoted and co-developed the WNI satellite project for the 2010 launch along with Tokyo University, Chiba University and AXELSPACE since 2005. The WNI satellite has some characteristics that differ from a conventional satellite. We will realize the Eye-Servation of the greenhouse gases by evaluating the atmosphere attenuation by a laser beam between the WNI satellite and surfaced-based Eye-Servation points. Eye-Servation instruments will be given to people all over the world, who are collaborating with our project. These instruments will achieve high quality of data collection above that of conventional satellite remote sensing systems. Certain shipping companies have agreed to join this project and plan to mount Eye-Servation instruments on their fleets, which include ships across all oceans. This collaborative project that involves world-wide community participation is a unique plan that nobody has ever done before. The WNI satellite project is an Eye-Servation project that involves interested participants (not only those from industry, but also academic and the public). Weathernews has a plan to identify the WNI Satellite Project members widely. Every supporter will be able to receive the latest information about the WNI satellite through the Weathernews ‘Total Fleet Management Service’ or corporate websites. The launch of the satellite is part of a dream not only of Weathernews, but of many supporters world-wide as well. The possibility of increased economic activities in the Arctic area have recently made major headlines as sea ice in the Arctic is melting faster than expected. The polar route (every seafarer’s dream) has increasingly gained the attention of many shipping companies. Weathernews will mount a visible infrared / near infrared camera on the WNI satellite in order to monitor sea ice in the polar region. In support of more accurate weather forecasts and analyses of actual ice conditions, these Eye-Serve evaluations lead to the realization of the polar route and to safe navigation. The Concept of the WNI satellite system is quite different from the more conventional satellite system. The vast number of supporters enable the implementation of an extensive network of receiving (Eye-Servation) points on the surface. Existence of this surface network provides various to the WNI satellite system. 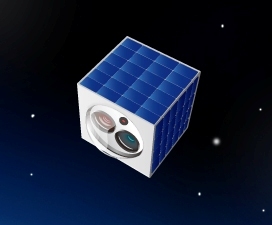 (1) The micro-satellite can achieve the mission objectives. (2) Short period and low cost for micro-satellite development. (3) Low launch cost using piggy back approach. (4) Expansion of the surface network will be decided after initial confirmation of system effectiveness. Shinichi Nakasuka, a Professor of University of Tokyo, Department of Aeronautics and Astronautics comments about this satellite project. Weathernews will continue to seriously pursue this WNI satellite project along with many supporters, aiming also to continue to develop quality and unique weather services. ※1：AXELSPACE (The total technological micro satellite company) will be founded as a venture business of Nakasuka Intelligent Space Systems Laboratory that supports the development and the launch of the EWNI satellite. ※2：Eye-Servation is a term unique to Weathernews. “Eye-Servation” is not merely the collection of facts, but also includes the way the person or the machine “feels” at the time.